Numismatics is collecting coins. The word numismatics comes from the adjective numismatic, meaning "of coins", borrowed 1792 from French numismatiques. Some collectors seek old coins for their value and the increase of this, others as a historical record where something inanimate actually has a story to tell. Made from bronze, copper, zinc and tin and weighing 5.67grams on average, the Australian Halfpenny was equally to 5/12c when decimalisation occurred in 1965. However, in 2009 one of these, a rare 1923 halfpenny (Proof), sold for $500 000.00. A Proof coin is made with a specially polished and treated die and it also each coin is struck two or more times by the coin die. By striking it more than once the metal is forced into all the crevices of the die, thereby giving a very fine detail to the image on the coin. This fine detail does not appear on some non-proof coins. 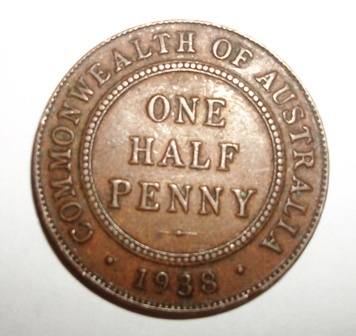 The rarest Australian halfpenny is the one minted in 1923. The 1923 Royal (Branch) Mint records indicate that 1,113,600 halfpennies were struck in Sydney, while none were struck in Melbourne at all. The story does not end here however; as later research by John Sharples, (Numismatic Curator of the Museum of Victoria) has proven that the coins struck in Sydney in 1923 were actually dated 1922. The elusive 1923 halfpenny was actually struck in Melbourne sometime between September and November 1923, with the number struck assumed to be around 20,000. These were put aside for many years and only issued after the 1924 halfpennys had been struck; thus their rarity, and if in ‘Proof’ condition, the higher price demanded. Before the opening of The Royal Australian Mint in Canberra (1965) Australian coins were struck at branches of The Royal Mint – the Sydney Mint, Melbourne Mint and Perth Mint. The Royal Australian Mint holds a place in history as the first mint in Australia not to be a branch of The Royal Mint in London. The only other operational mint in Australia is the Perth Mint. During the 1920’s Australian mints faced an uncertain future and competition for coinage contracts became very competitive. 1923 was the year the first time the Melbourne mint was requested by Treasury to produce halfpenny coins. The other interesting aspect of these halfpennys is the change of silohette represented on the Obverse, or ‘head’ of the coin and the change between the Reverse or ‘tail’ of these coins. 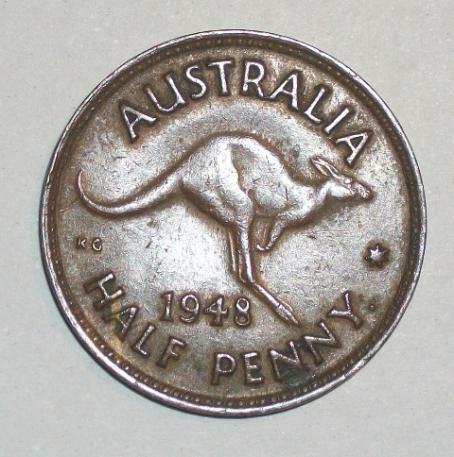 In 1938 the One Half Penny words remained on the reverse and did into 1939 when the kangaroo design, by George Kruger Gray, became the Reverse on these coins in the last few months of 1939. This design, of a bounding kangaroo beside the Commonwealth Star (also known as the Federation Star, the Seven Point Star, or the Star of Federation) a seven-pointed star symbolising the Federation of Australia which came into force on 1 January 1901, appeared on pennies and half pennies until decimal currency came in and has appeared on some special editions since. 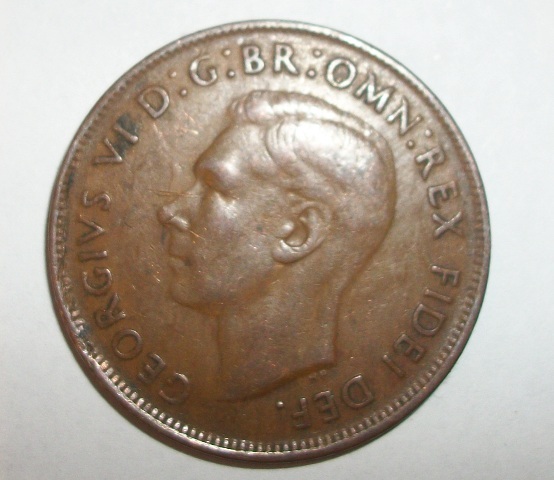 The Obverse of our halfpennies changed in 1938, 7 months after the coronation of King George VI, when Australian coins bearing his majesty's bust were produced. These were designed by Thomas Paget. In 1953 as Elizabeth II became Queen of the Commonwealth, Mary Gillick’s (sculptor) effigy of Elizabeth II was used on coinage in the United Kingdom and elsewhere. Her design remained on all coins until 1967. These effigies show Her Majesty wearing a wreath of olive leaves rather then a crown as she does on our current coins. An Australian 1938 bronze Halfpenny (George VI), uncirculated and in absolute mint condition currently fetches between $115 -$210 AUD. If it has been circulated but still in good condition, it might fetch anything from $0.75 to $20 AUD. There were 5.174 million minted. An Australian 1938 bronze Halfpenny (George VI)(Proof), uncirculated and in absolute mint condition could fetch up to $25,000 AUD. 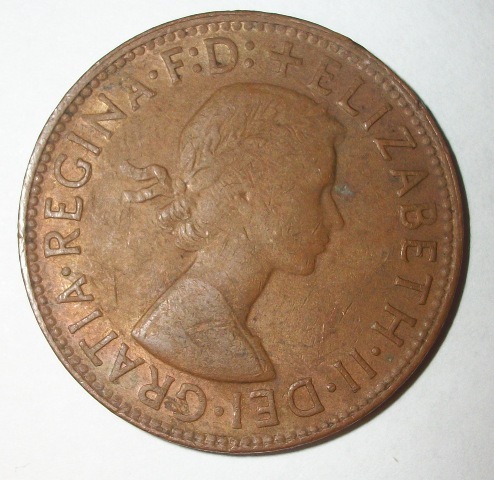 An Australian 1953 bronze Halfpenny (Elizabeth II)(minted in Perth - mintmark = A. ), uncirculated and in absolute mint condition could fetch up to $45 AUD. If it has been circulated but still in good condition, it might fetch anything from $0.75 to $8 AUD. There were 23.967 million minted.